It has been nice to hibernate for a few days here in Inuvik, relax for a change, slowly catching up on nearly two months of back log of emails, yahkks! Last week, I saw the temperature soar to 32C. WOW, that's was hot. The arctic is melting and everybody else too! AC was running at a couple of meetings last week. Really! using air conditioners in the Arctic. Its been a few days since I last saw the midnight sun, the sun now dipping below the horizon by midnight, the air is still haze, full of particles from forest fires in Alaska, BC and Yukon. Inuvik is buzzing with the 40th Annual Northern Games, it will officially start tomorrow (August 6 - 9, 2009). I guess saying buzzing is relative, Inuvik is a small town with only 3500 habitants, the equivalent of one downtown block of a large metropolis. There might be at least another 500 people in town for the games. Went for a walk and by chance came across some early celebration, groups of first nations singing and dancing at the main stage, man and women dressed in traditional clothes expressing themselves through the beat of the drum. The dance reflects acts of their daily lives, hunting, cooking, family, etc... very suiting to watch, it remind me of Japanese traditional dance, gentle moves. After a few songs each group invited everyone to participate, join them on the stage, tomorrow I'll be wearing my dancing shoes and doing a sun dance :). The Northern Games festivities is giving me an opportunity to learn and appreciated the local culture even more. Haven't tried a mak-tak (whale skin and blubber) but is in my to do list, being a vegetarian will have to wait a bit longer. I heard is very grease. Glad to be here and learn more about these wonderful people and culture. They have been living of the land in a sustainable way for thousands of years. I noticed their art work reflect peace and harmony; drawings, paintings, sculptures of animals, daily lives events like dancing, cooking, hunting, family but not war. I am yet to see any art work of that nature. Perhaps we could learn a few things from them. Special thanks to Capital Suites for their hospitality. Got permission from Canadian singer Ken Lavigne to use "canto della terra" on the documentary of the solar car. Yeah!!!! Below is a link to his website, check out the "Ken Lavigne believe album to hear the song. Juanita introduced me to Ken and his music, she said every time she heard canto della terra she sees visions of the solar car and its journey. Good call Juanita, thank for the introduction! I Have been looking at the logistics of driving the solar car on the longest ice road in the world, the road from Inuvik to tuktoyaktuk. Oh boy, it will be a bit of a challenge trying to find a balance between getting reasonable amounts of day light (the sun is sill very low in the horizon) and at the same time make sure there is no water on the ice road. In order to get enough light, the later in the season the better. However, if I leave too late in the season, there will be water on the ice road and ridges making the drive very difficult. I heard it can get as deep as 60cm (two feet) before the break up. That is as high as the solar car itself. Considering there is no heat inside the car, it will have to be done in a clear day, it would not survive a storm. I'll have to find a creative way to keep warm inside the car. 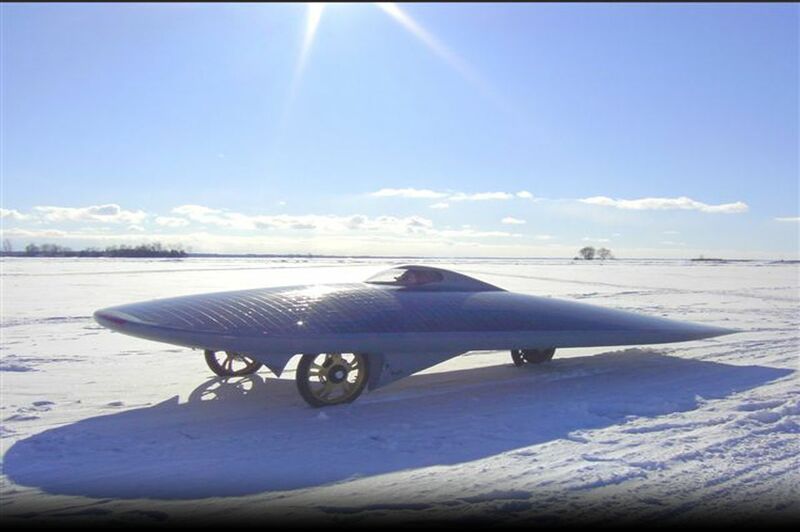 The tentative date to drive the solar car on the ice road is April 10th 2010, one and half week before the break up. Below is a comparison of daylight and twilight hours: Inuvik and New York City. I don't particularly enjoy the cold but I am looking forward to the challenge. I'll probably regret saying this the minute I get locked inside the car at about -30 degrees Celsius (-22 degrees Fahrenheit).